Downloading files by means of the P2P networks has become very popular over the years, and nothing better than a very light and versatile desktop client to be able to carry out the downloads via one of the most important P2P networks (BitTorrent), like Torrent2exe. 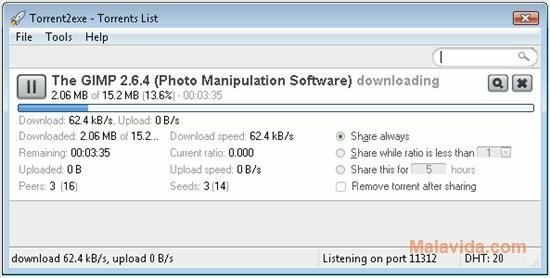 The idea behind Torrent2exe is to have a program that, at the same time that it allows you to download Torrent files directly from the desktop, also allows you to convert any Torrent file into an executable EXE that can be used regardless of the computer chosen by the user, without any need to have a P2P desktop client installed. 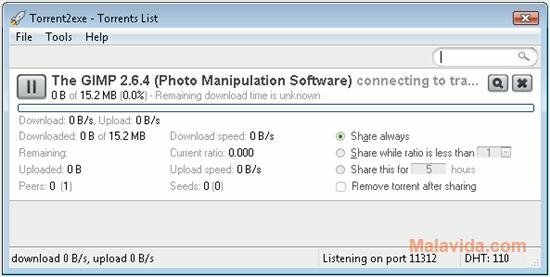 To be able to use the general interface of Torrent2exe all you have to do is drag and drop any Torrent file on to it to start downloading the files that are part of it, or on the contrary, you can activate the association between the application and Torrent files, in such a way that it will open them and activate them automatically as soon as they are downloaded. On the other hand, the program offers us the possibility to open the developer's website to be able to create EXE files with the Torrent files, whether using a file that you already have on the hard drive or by inputting the URL address of the desired Torrent. 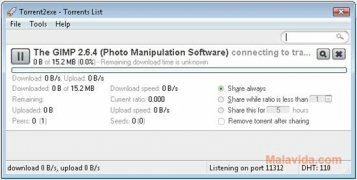 If you want to have a desktop client for the Torrent files that you download, you only have to download and install Torrent2exe.